The storm is called a “Bomb Cyclone“, it is called “Bomb Cyclone” because it is a nod to the process “bombogenesis” that forms it. 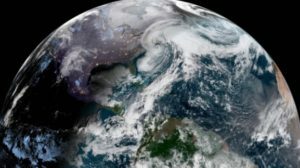 Bombogenesis occurs when the storm’s central low pressure plunges by at least 24 millibars: an atmospheric pressure measurement in 24 hours, indicates the National Oceanic and Atmospheric Administration (NOAA). 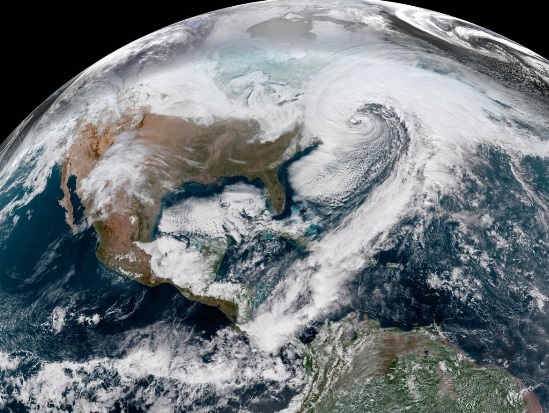 A fabulous video from space shows a winter storm: slamming into the northeast United States. The photos from the GOES (Geostationary Operational Environmental Satellite)-East satellite show the storm developing and morphing since Tuesday February 27. “Take this storm seriously!” the National Weather Service in Boston said on Twitter on March 1. “This is a LIFE & DEATH situation for those living along the coast, especially those ocean-exposed shorelines.” The NWS added that people in “ocean-exposed shorelines” should pay special attention. The service forecast moderate to major flooding, with effects on buildings ranging from structural damage to total destruction. The storm has incompletely 80 million people along its path, with 22 million of those affected by a coastal flood warning, according to Space.com. Winds by midday were blowing faster than 50 miles an hour (80 km/h). In that days more than 3000 flights were cancelled in the United States especially in the northeast airports of New York City, Philadelphia and Boston. The term bombogenesis comes from the merging of two words: bomb and cyclogenesis. All storms are cyclones, and genesis means the creation or beginning. In this case, bomb refers to explosive development. Altogether the term means explosive storm strengthening. Bombogenesis takes place when a midlatitude cyclone rapidly intensifies, dropping at least 24 millibars over 24 hours. This can happen when a cold air mass strikes with a warm air mass, such as air over warm ocean waters.